The Trans Am series will be racing Sunday July 5th in the Ryan Companies Independence Day Classic at Brainerd International Raceway. This race has traditionally been held over Labor day weekend. To preview this event, here is an interview we did with Gary Curtis, Director of the Performance driving school at BIR. This series raced at BIR from 1969 to 1989 but then it just went away. 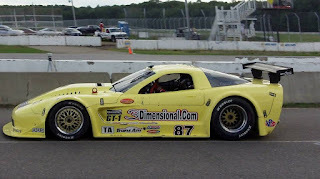 It was revived and brought back to BIR in 2010 and then acquired by Minnesota veteran driver Jim Derhaag who raced his 151st and final Trans Am event here in 2010. That first race back saw only 7 cars on track and MN native Tony Ave won by 65 seconds, almost a full lap over 2nd place. Things have changed for the better over the past 5 years, the race set for this weekend has 41 entries and the Trans Am series now has 3 different divisions all racing together. 12 drivers are entered in the top TA division sporting Corvette bodies and 800 horsepower. 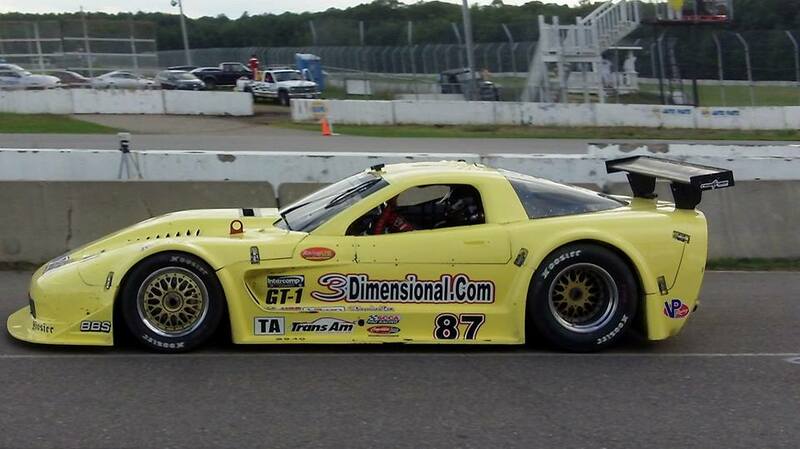 #87 Doug Peterson from Bonita Springs (FL) is a veteran driver who has won the previous two years here at BIR. 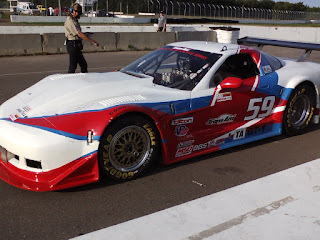 #59 Simon Gregg from Ponte Verde (FL) is the 2012 Trans Am series Champion, but he has not won at BIR. 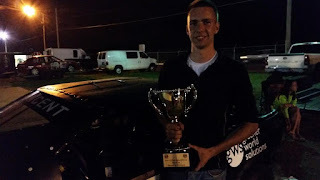 #4 Paul Fix from Williamsville (NY) is 2nd in points and he is the only driver other than Ruman to win a race this year. 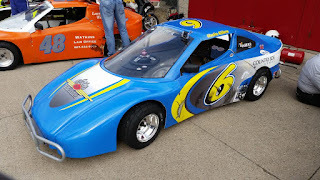 #07 Jed Copham is our local Brainerd racer, plus he owns the track. He does have a shot, nobody has more experience at this track, in 2013 he finished 5th. #36 Cliff Ebben from Appleton (WI) has been so close to winning here at BIR, but has come up just short. 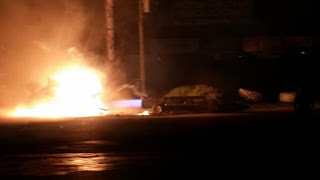 He has had some bad luck too, including when he destroyed a car here back in 2011. Qualifying will be Saturday July 4th at 2:20pm with the 40 lap 100 mile race on Sunday July 5th at 1:50pm, the race usually takes between 60 and 90 minutes to complete. If the past races are any indication you can expect one or two cautions during the race. The Brainerd International Raceway competition road course is 13 turns and 2.5 miles, I recommend trying more than one location to watch the action. You can bring a chair or stand on the bridge, you can see the tightest and slowest corner on the track just past the pit lane and the drivers will race right underneath you. I also recommend going into the infield and checking out the action on some of the high speed locations. Bleachers are set up in numerous locations. The race paddock and pit lane is also open for fans, it is a very active place during pre race and post race festivities. The track was repaved two years ago, this Spring curbing was put in and the track work is complete. 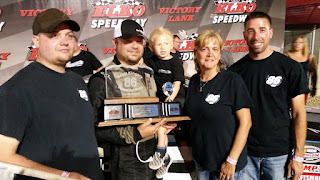 For a full recap of the Trans Am action at BIR including interviews with the winners listen to Speed Talk on 1360 Saturday morning 10-11am on KRWC1360.com or search #BIR on Twitter. This race will be broadcast on a tape delay on CBS Sports Network at a later date. 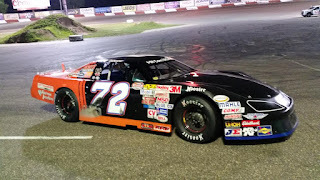 Jacob Goede from Carver (MN) continued his incredible string of great finishes in the NASCAR Whelen All American series MN Corn Growers Super Late Model division at Elko Speedway with his fifth win in seven opportunities so far in 2015. Goede started 7th in a field of 20, Derek Lemke lead the first half of the 40 lap feature before Billy Moen took over the top spot, Moen was then quickly swallowed up by Goede who lead for the final 14 laps of the race. Below is the YouTube video of the Goede pass for the win..
Goede held off veteran driver (1976 Champion) Mark Lamoreaux by .374 seconds at the finish line for the win, with Moen rounding out the top 3. Goede now holds a 54 point lead over Nick Panitzke and 55 points over his brother Matt Goede in the standings. Three time Champion Conrad Jorgenson from Lakeville (MN) finally swore off his bad luck and won the Genz-Ryan Thunder Car 20 lap main event. Harm Alken took the early lead until point leader Jeremy Wolff took over with 15 laps to go, Conrad Jorgenson then slipped past Wolff at the half-way point and took home the hardware for his first win of 2015. 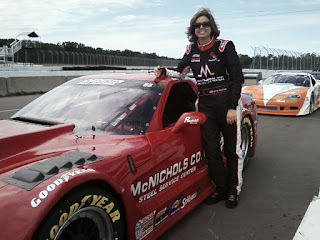 He won by 2.368 over Wolff and 4.035 seconds over Tina Davis who finished third. Three time Champion Brent Kane wrecked and hit the wall on lap 6, he finished 13th and went to the hospital for observation, Kane remains second in the point standings, 10 points behind Jeremy Wolff. The Pepsi Power Stock main event was full of drama from start to finish. In the end it was Dusty Mann from Farmington (MN) declared the winner. Mann lead most of the 20 lap race but ran out of fuel on the last lap, was passed by Nick Oxborough and crossed the line second. "The car was running out of gas for four laps before the end, I started swerving, trying to slosh the fuel around in the tank just hoping to hang on," said Mann "once we were out of gas, there wasn't much I could do but just coast." Defending Champion Oxborough and his fans were jubilant in victory lane with the dramatic last lap win but that all changed when he was disqualified after post race inspection. "Nick came up to me in the tech barn (before inspection) and said that he hates to win one that way and we shook hands," said Mann "then ten minutes later he ended up getting DQ'd and I ended up going back to him and saying that I hate to win one that way." "It was a great night overall for us, I want to thank Paul Hamilton and his crew for letting me race his spare car, I just like to have fun for as long as they will let me do it," said Mann. The results don't lie, Mann won the feature and became the sixth different winner in 8 races so far in 2015. Taylor Goldman scored a second place finish and point leader Tom Doten was credited with third, now he has a 26 point lead over Cole Neisius and 28 points over Goldman in the standings. Defending Champion Chris Marek from Lakeville (MN) won another Hiway Federal Credit Untion BIG 8 Late Model feature event at Elko Speedway. Marek edged Michael Ostdiek by 1.065 seconds at the finish line of this 25 lap event to win his 6th trophy in 9 races so far in 2015. Marek now has a 44 point lead over both Ryan Kamish and Dylan Moore in the standings. 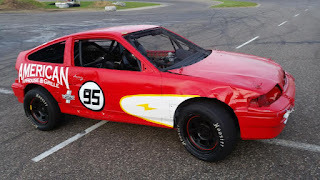 Brady Fox-Rhode from Loretto (MN) has lead the point standings all year in the Great North Legends but has not won since week two of the season. 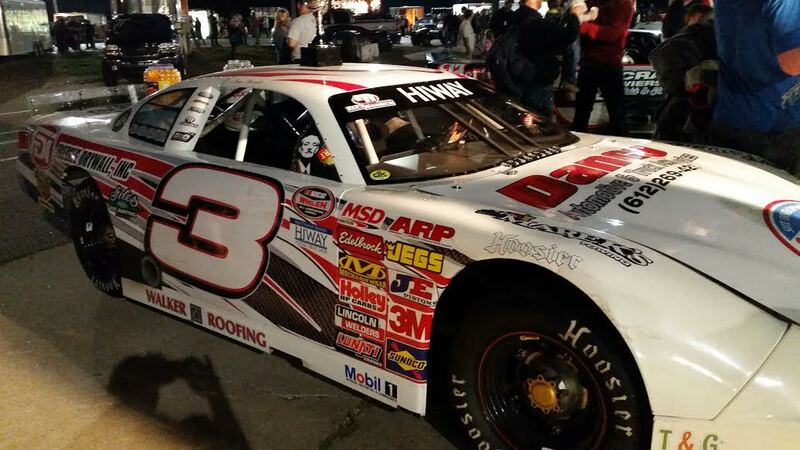 That changed with a win on Saturday night at Elko Speedway. Fox-Rhode passed Robby Carter with 7 laps to go and held off Jaycen Brockhouse by only .130 seconds at the line to take the victory. 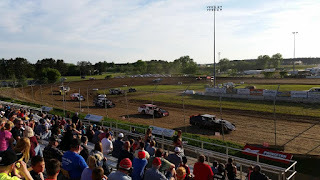 23 cars started the 20 main event and everyone finished on the lead lap with the exception of Matt Ostdiek who hit the wall hard in corner number four, did major damage to his car and did not finish the race. This is a very evenly matched division with five different winners in seven races so far in 2015. Brady Fox-Rhode has a 12 point lead over Derek Lemke in the standings. 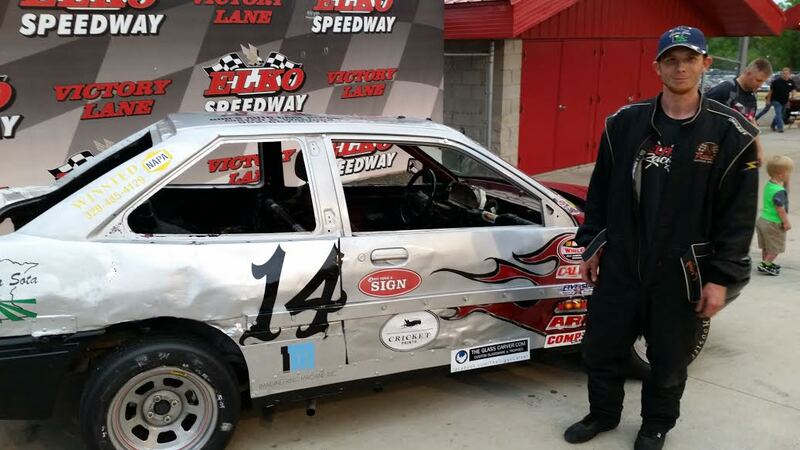 Alex Vincent from Owatonna (MN) won his first ever Hornets feature event at Elko Speedway and he had to hold off the current point leader Justin Schelitzche for the win, "It was a little nerve-wracking I knew it would be hard to stay in front of him, so I just ran my line and stayed out front, it was fun" said Vincent. This is the third year of racing for Vincent and it was his first win, "it's great, my family has put in a lot of time and working hard on the car and the hard work is starting to pay off, it feels good" said Vincent. Schelitzche now has a 24 point lead over Ashley Bell in the Hornets point standings. 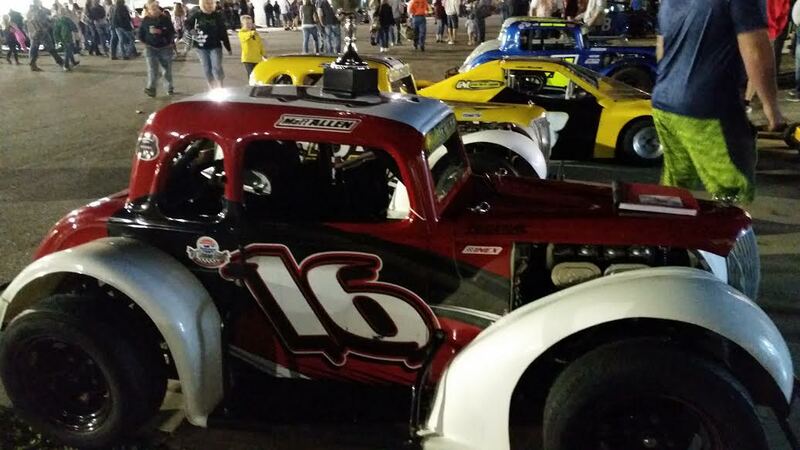 The new Hornets Figure 8 division ran two exciting 15 lap feature events. 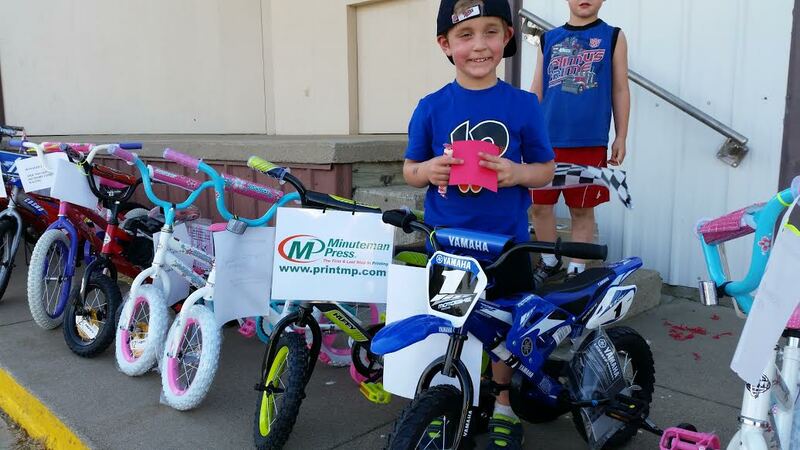 Troy Tuma (photo below) from Waseca (MN) won the first race and newlywed Dan McCarthy from Bloomington (MN) won the second. 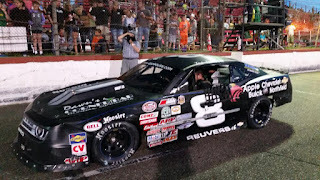 Both features were full of close calls and near collisions in the "X," Brian Adams drove Brandon Olsons' car to a second place finish in both the races. 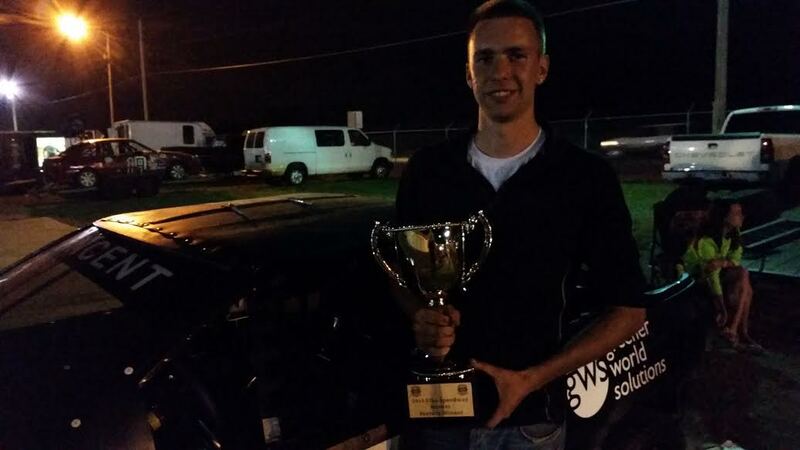 12 year old Owin Giles from New Market (MN) won his 3rd feature of the year in the Bandolero division. Giles holds a 27 point lead over Luke Allen in the standings. Coming up next at Elko Speedway will be an Independence day celebration Eve of Destruction on Saturday night July 4th. Expect racing in the NASCAR Whelen All American Series plus a HUGE Fireworks show, Dueling Monster Trucks, School Bus races, Spectator Drags and much more including a free concert by Johnny Holm after the races in Champions Event Center at Elko Speedway located 20 minutes South of the Twin Cities just off of I-35 and County Road 2. Gates open at 5pm with action beginning at 6pm. 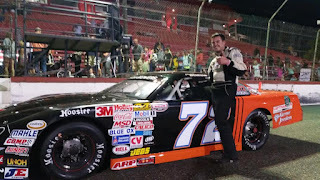 Goede started up front and never looked back, he bested the 23 car field for the entire 40 laps in the NASCAR Whelen All American series, he finished just in front of 9 time Champion Donny Reuvers by 1.127 seconds at the line. 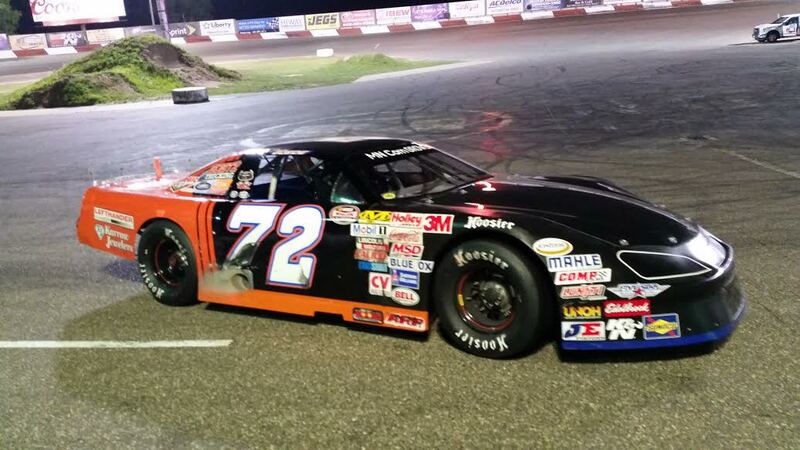 Jacobs' younger brother Matt Goede started seventh and moved up to third. Inaugural winner Brent Kane ended up with a flat tire and had to pit causing him to finish 21st. "We did have a little bit of contact," said Reuvers "I guess I don't know if I caused that (flat tire) to Brent, if so, I am sorry, that's racing." 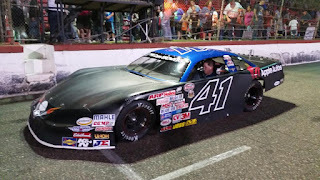 Dusty Mann lead the 24 car field of Genz-Ryan Thunder Cars to the green, he lead early in the race and then had a great battle with Reuvers for the top spot. "Dusty is a good hard racer and nobody wrecked so that is what counts," said Reuvers who finally got past Mann on a restart with 14 laps to go. 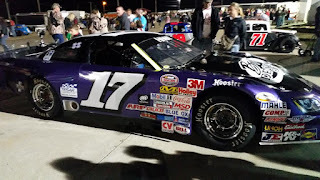 This race is in honor of Scott Kingery a former racer and car owner at Elko Speedway who died of cancer. 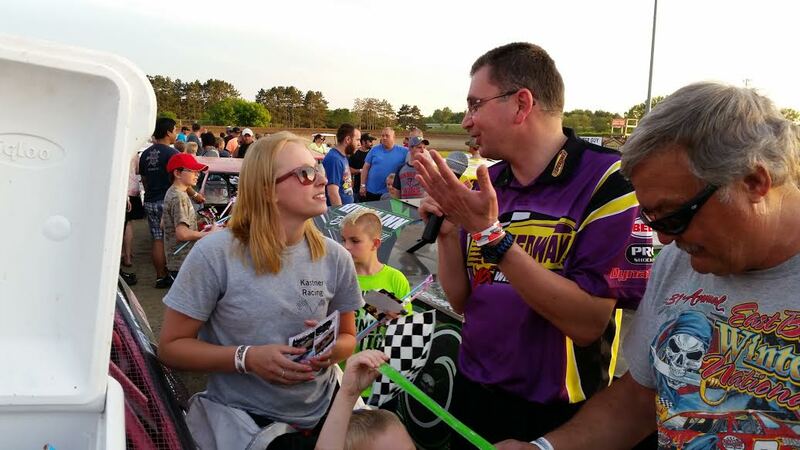 His wife and family was in attendance and actively participated in all aspects of the race night, "Scott was out here (at Elko Speedway) for as long as I can remember," said Reuvers "it's a tough deal, but his memory keeps going." Jon Lemke and Ryan Kamish had a furious side by side battle for the lead until lap 7 when Berthiaume passed them both on the low side in corner number two, "I just closed my eyes and made the pass," said Berthiaume jokingly "these wins are hard to come by." 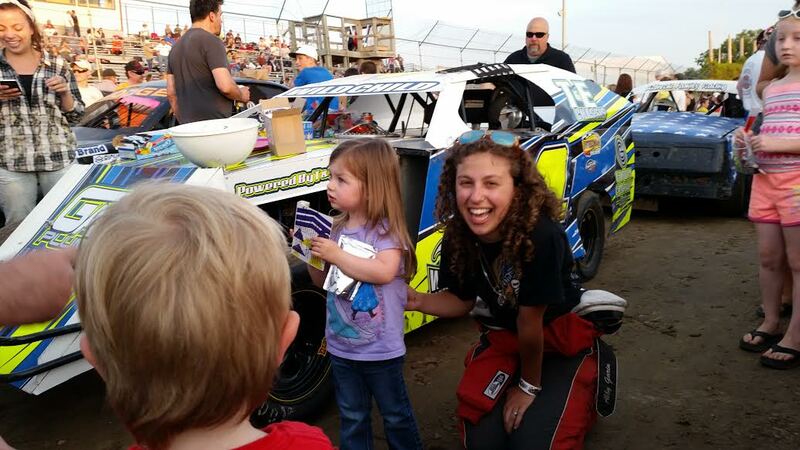 Princeton Speedway races on Friday nights at 7pm. 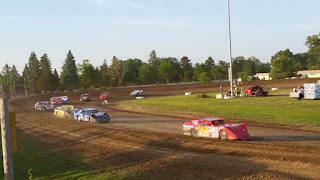 It is a unique 1/4 mile high banked "bull ring" style dirt track just 30 minutes North of the Twin Cities on Hwy 169. It is a fairgrounds type facility with aluminum bleacher seating. The track has been in operation since 1956. The track surface is very good, no rocks, it stays tacky and does not lose moisture as quickly as some Minnesota tracks. The corners are banked very nicely creating a fast top groove on the cushion, even the back stretch is banked. Some nights the middle groove gets dry slick making the very low and flat bottom groove the fast way around. Once per year Princeton Speedway gives away bikes to young race fans and parks all the race cars on the front stretch during intermission, they open their gates and do a driver meet and greet with all the fans. It was very well received. The crowd seems pretty laid back and relaxed. 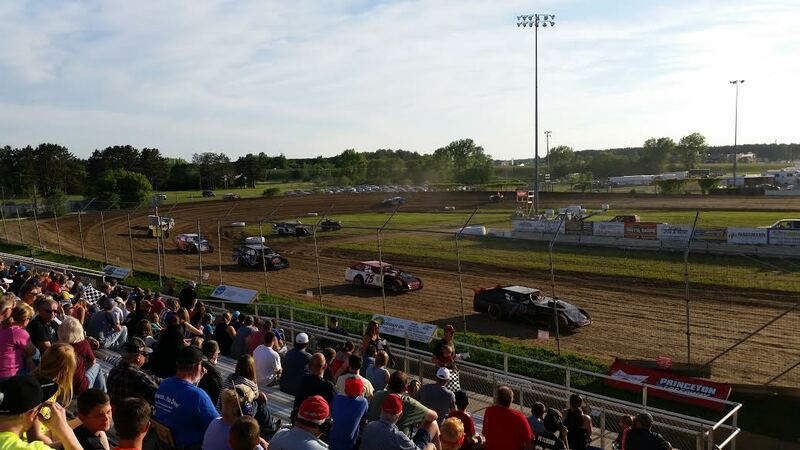 The track runs 6 divisions of cars and averages between 60-80 cars per night, on special occasions they also race Sprint Cars. 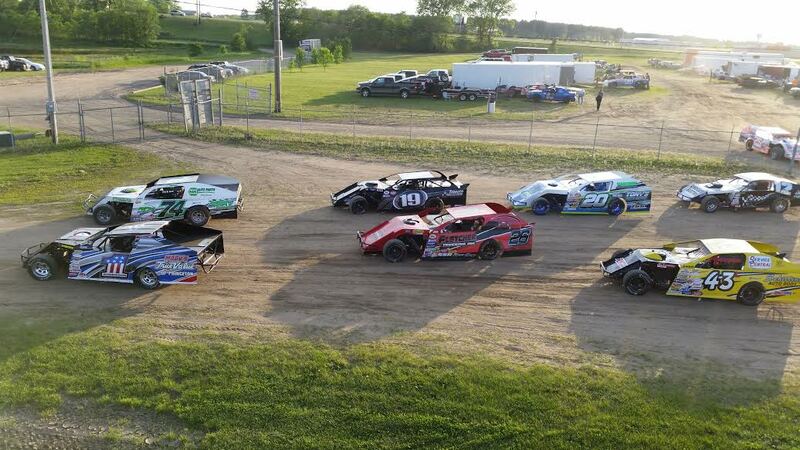 Their regular divisions are IMCA Modifieds, IMCA Sport Mods, Super Stocks, Mod 4's, Street Stocks and IMCA Sport Compacts. The cars line up in the pits and enter the track from behind corner four. Here is a shot of the Mod 4's in action from the main grandstand area. Dean Reller the announcer is professional and informed and they keep the program moving, it usually is done by 10pm or so. 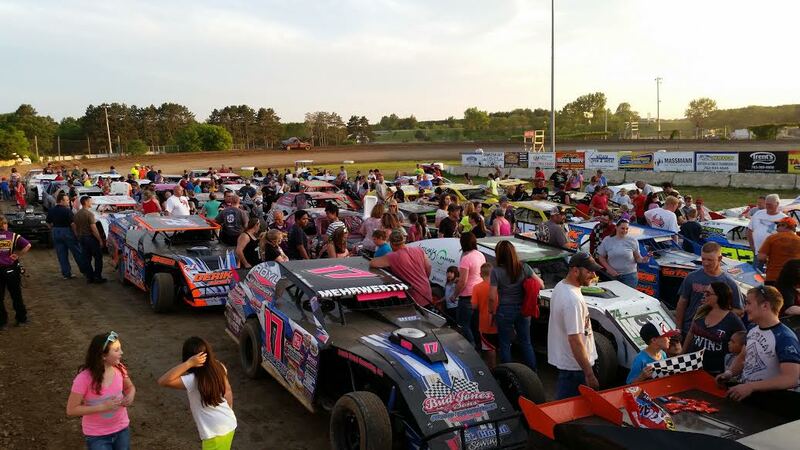 Labels: Entertainment, MN dirt tracks, Princeton, Princeton Speedway, Twin Cities, What to do? The field was inverted for the second feature and veteran driver Jon Lemke took home the trophy. "It feels good to get the first win out of the way," said Lemke "the BIG 8's are a tough class, anyone can win on any given night," said Lemke "these cars are fun to drive, the 8 inch tire can really be a challenge." Tom Doten from St Paul (MN) won the first Pepsi Power Stock main event. Doten started up front and never looked back, he won by 1.111 seconds over Shawn Grabinger. "I've been here since the early 1990's, it's fun, it's my adrenalin,"said Doten "it's actually my sobriety, I've been clean and sober for over 13 years now." Tom Doten raced years ago when Power Stocks struggled to get a good car count at Elko Speedway. 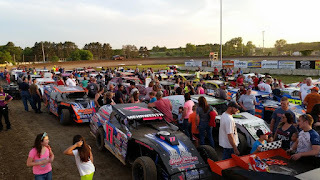 Now the field is large every week, 22 cars raced on Saturday night,"this is a great class with lots of great guys to race with" said Doten. Doten has taken the point lead by 17 points over Oxborough in the standings. 2009 Champion Jaycen Brockhouse from Savage (MN) won the Great North Legends main event. Brockhouse passed Brady Fox-Rhode late in the race and held on for the win by .367 seconds. Last weeks' winner Matt Allen finished third followed by Jaycens' dad Tim Brockhouse in fourth. Justin Schelitzche from Lester Prairie (MN) won for the second week in a row in the Hornets division. Schelitzche took advantage of a late restart to pass Alex Vincent for the win by .297 seconds. Schelitzche is also the point leader with a 27 point advantage over Ashley Bell in the standings. After the racing the crowd was entertained by two incredible stunts. In the first time back since recovering from a injury, Jennifer Schneider better know as Cannon Lady, was shot out of a cannon over 127 feet through the air into a net. Her husband Radical Rob cut short his stunt man career to travel with Jennifer and perform his TNT stunt, he enters a box and blows himself up with a stick of dynamite. Doug Rose then thrilled the crowd with his 11 time National Championship Jet car named the Green Mamba. He melted two junk cars down to the ground with his J46 Jet engine powered drag car. See video below. 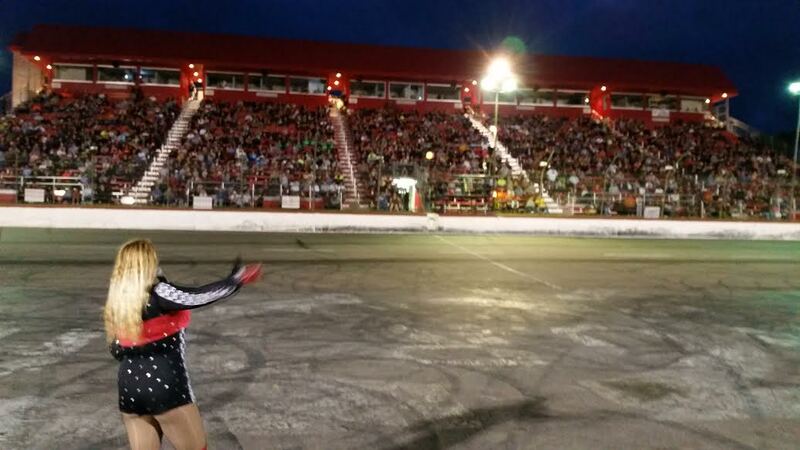 The School Bus races, J J Romans Motocross Stunt team, and Spectator drags also entertained the lively crowd. 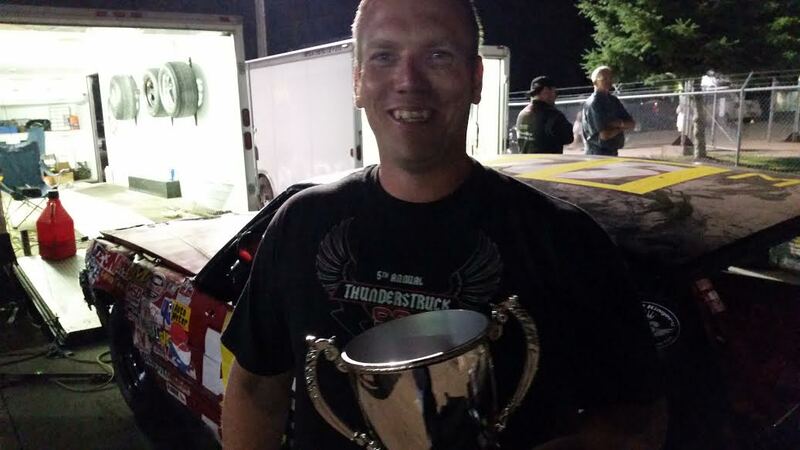 Nine time Champion Donny Reuvers from Dundas (MN) won the 40 lap MN Corn Growers Super Late Model feature event. He fought off challenges from defending Champion Jacob Goede who was pressuring him from below "the bottom is so tough to get by, you can only run about 4 or 5 laps down there before you have to cool your tires down," said Reuvers. Goede eventually slipped back to fourth and Nick Murgic charged to the front and had a great battle with Reuvers, "Nick is a good driver" said Reuvers "you never have to worry about him sliding up and hitting you, it's fun to race hard like that." 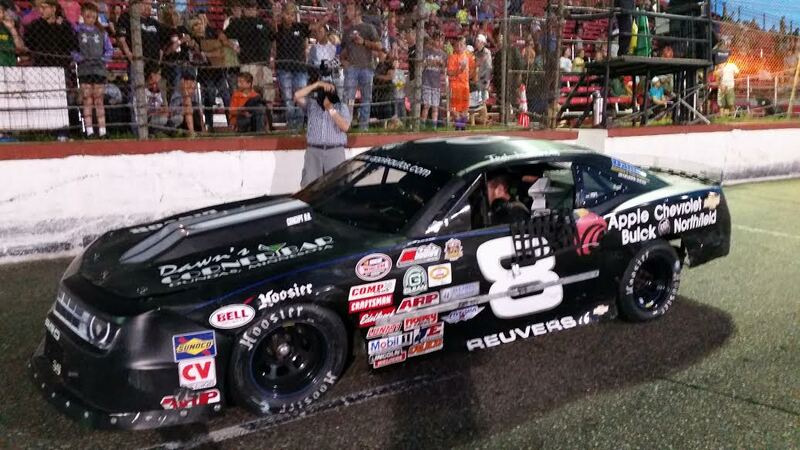 This was the first win at Elko Speedway in two years for Reuvers who has spent some time racing regional touring series recently "it's nice to travel just twenty minutes and be at the race track, especially tonight with how many fans were here," said Reuvers. Sixteen year old Matt Allen from Chanhassen (MN) won his first ever Great North Legends feature event on Saturday night, "It felt amazing" said Allen "I've thought about this feeling for quite a while, it's hard work but awesome." Allen beat out Derek Lemke by 2.4 seconds with Will McCully finishing third and Shon Jacobsen fourth. Once Brown got the lead he had to fight back the many challenges of Dustin Mann to win by .311 seconds at the finish line. 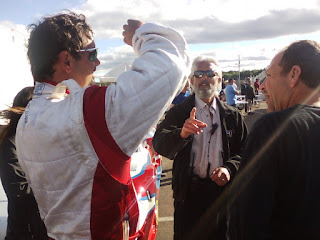 Defending Champion Nick Oxborough finished third and last weeks' winner Tom Doten got fourth.